DANG, Feb 19: Every year, the government formulates various policies and work plan regarding the extraction of resources from rivers. As per the work plan, operators of crusher plants and other contractors are allowed to dig only to a certain level of the rivers and are prevented from using heavy machines. However, even big projects run by the government tend to breach the rules while extracting resources from the rivers. The negligence of contractors not just threatens exhaustion of the resources but also compels the river to change its course. This has put hundreds of lives under the risk of land erosion and inundation. It has been found that Praganna Irrigation Project (PIP) and People's Embankment Program Office (PEPO) based in Lamahi are neglecting the rules formulated by the government. These offices are conducting embankment and irrigation projects along the Rapti River in Deukhuri. 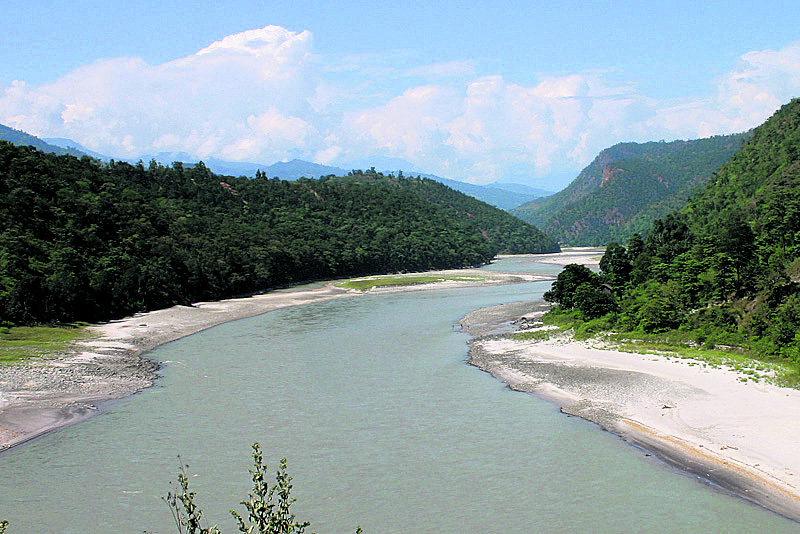 The district-based monitoring committee recently warned both of these government-run projects regarding the illegal extraction of materials from the Rapti River. "Both the projects were found breaching the law while extracting resources," said Krishna Prasad Gautam, secretary of the monitoring committee, adding, "The rampant excavation has changed the course of the river putting hundreds of lives at risk." According to Gautam, the irrigation project is illegally excavating resources from the Rapti River for the construction of irrigation canal. "As per the rules, the project must at first seek permission from the district monitoring committee for using excavator but they are using it without our consent," said Gautam, adding, "They have dug up a huge trench in the river which may have serious repercussions." Similarly, the embankment project has been extracting resources from the Rapti River for the construction of embankment. The monitoring committee has strictly warned both the projects to follow the legal processes. "Government projects neglecting the law have set a bad precedent," said Gautam. He further stated that stern action would be taken against them if they continue neglecting the law. Meanwhile, the officials of the embankment project have stated that they have handed over the project to the contractor and have no idea how they have been carrying out the work. "It is not possible to complete the project without extracting resources from the river," said Himal Paudel, the project chief, adding, "The district monitoring committee has accused us of illegally extracting resources. So, we will have to hold discussion with the contractor to find out how true it is." Both of these projects have been accused of evading tax for extracting construction materials since the beginning of the current fiscal year. The monitoring committee has also written letters to inform both the projects regarding the pending tax payment.